Showing UP in your day! Rooting for the underdog & voices that aren&apos;t heard or struggling. Being a mommy & making your kids a priority! My every fiber is for my kids! Music & dancing & choreography & being a bad&ss when I&apos;m doing it! Plus LOTS More, that screams SASHA!!! It&apos;s my thang! I have to put in the time to practice practice practice over and over the new moves, learn them, and make them tight!!!! Even if I have no time!! Find it! Doing stuff that ignites ME, creates confidence & I feel good, regardless if anyone else digs it. Maybe hallenging yourself when you run or pushing yourself to be better at your craft, then do it daily! Maybe cooking or reading or art or being in the ocean. Whatever it is! Feels like YOU! Life is to be lived walking on water, not staying in the boat! Show UP in your life!!! 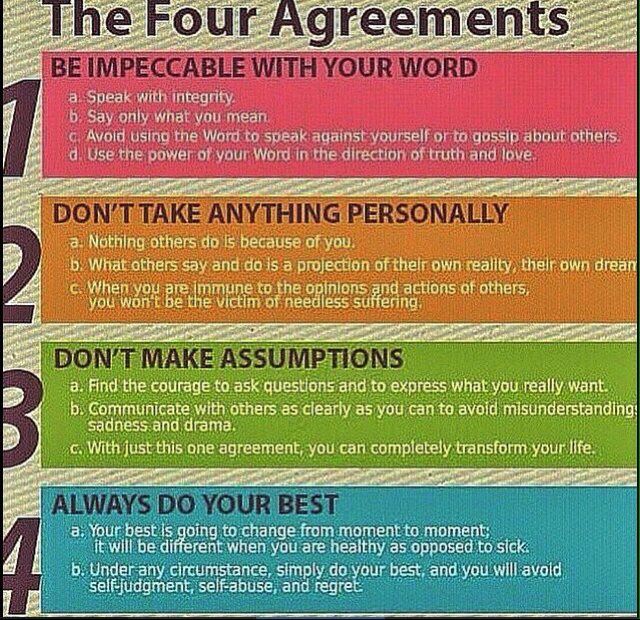 The 4 agreements are summarized below and they&apos;re awesome! They might say : you&apos;re so great at what you do and I love coming here you & deserve a big huge space so more people can come!!! This is an a-ha for me! Ps: especially with two kids my go to sentence is " ain&apos;t nobody got time for that!" I really don&apos;t & that is MY TRUTH! Loud + proud + loving! 3 tips to uplift your mood! tips to rock your mood + world!! Most of you know about our new addition to the family, the branching of coaching in the studio + my A-HA moments in this season of my life which will empower you + the weight loss challenge going on!! If you are a "Sasha talks" member, you are getting blasted with goodness daily + you feel the FAVOR + effects of it in your world!!
" hey I have faith!!" Sometimes you are in tough stuff- to USE & activate your faith..
All have proof of spirit & supernatural God all over it!!! Dig deeper. More soul less brain. Take time to quiet down & ask your higher power questions! You are way more significant & great & majestic than you can wrap your brain around!!! ( want more motivation + stuff like this!? SIGN UP for SASHA TALKS membership! Support + tools to use Daily!! Holistic nutrition. Personal growth. Spirit + soul. Encouragement. Empowers you + doesn&apos;t drain you + make you question yourself. I always say to my little brother, who is planning this magical + amazing wedding----your happiness & joy & success & good stuff is my JOY! I really don&apos;t dig- parents especially, or people who say " well I had it hard. I didn&apos;t have that. I never got that. That never worked out for me." And wants to "punish" someone who does get all that + kinda wants them to struggle. Or makes them feel like " how dare you have it easy. Or good luck on your own, no one helped me, so I&apos;m not helping you." Friends competing with you or one upping you, ain&apos;t a real friend, either. Celebrate. Be happy for others. Come from a place of SERVING! Easier + loving, rather than being a jerk! 3- think outside the box for food ideas. Instead of chips + dip, make a layered healthy + filling Mediterranean dip! Craving cinnamon rolls? I always am! HA! Just make the filling + eat! Booty loads of info + support + love in your journey. Get for kindle or on amazon.comTODAY!